A family friendly action-packed holiday. This is a package for the whole family to enjoy and is suitable for children from the age of 8 years old. 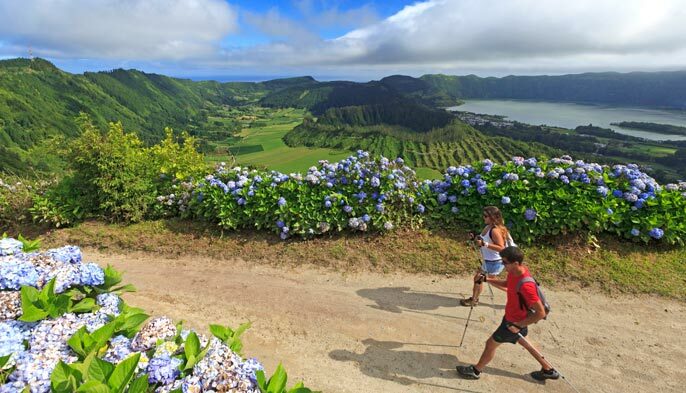 You will have the opportunity to view the volcanic complex of Sete Cidades and enjoy views over the lakes where you will have the chance to canoe, paddle board and cycle. 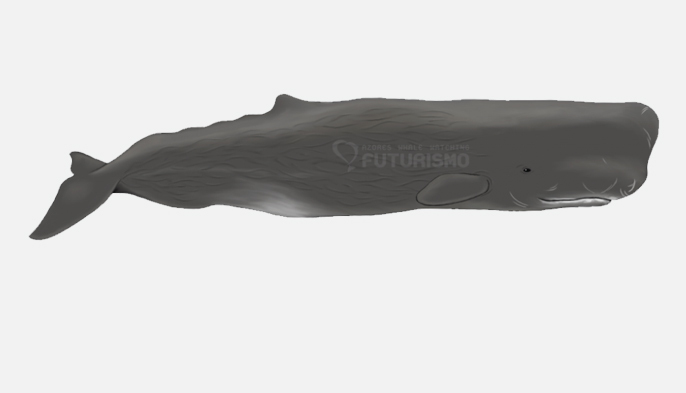 To add to this experience you will be able to enjoy a whale watching trip to discover some of the marine wildlife of the Azores Islands followed by the unique opportunity of snorkeling in the volcanic crater of Vila Franca Islet. Enjoy this package with your family! Our sit-on-top Kayaks have two ergonomic seats and enough room for a kid. Life jackets and double-bladed paddles are included. 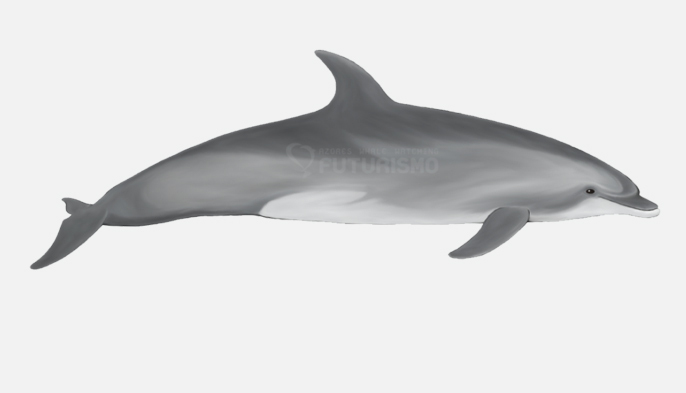 In the 3rd day we go to the blue ocean to see whales, dolphins, birds and other marine species. Visit the plantations and the centenary Gorreana Factory. Take a cup and try this delicious organic tea. Not recommended for children under 8 years old. All ages. Catamaran recommended for children and seniors. DAY 1 – Arrival to São Miguel Island and drop of to the Hotel. Free afternoon. DAY 2 – Pick up at your Hotel. Starting your adventure to Sete Cidades Volcanic Complex. Picnic lunch and drop off at Hotel included. (Full day tour). 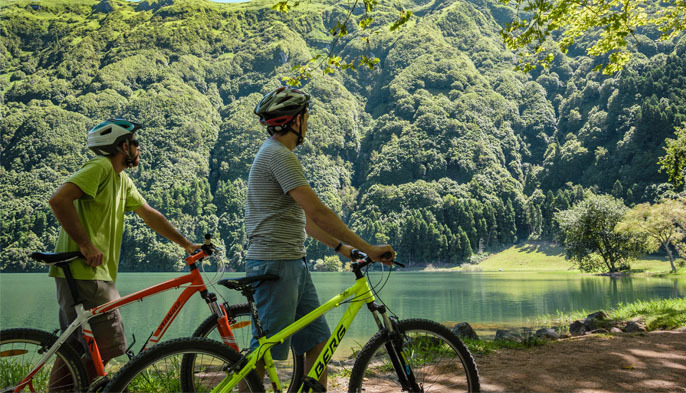 We will explore the West side of São Miguel Island by bike and kayak on one of the most astonishing lakes on the Island. Walking around the volcanic crater with the view over the several lakes and on the other side of the sea. Arrival to Sete Cidades village. We will start biking around and kayaking on the lakes. Picnic lunch on the lakeside. Continuing the tour through the south coast with a stop in Ponta da Ferraria. You will be able to take a swim in a unique place. If the tide is low you will feel the ocean water warmer and warmer. This is only possible due to the underwater gases from that specific location. A drop at your Hotel. 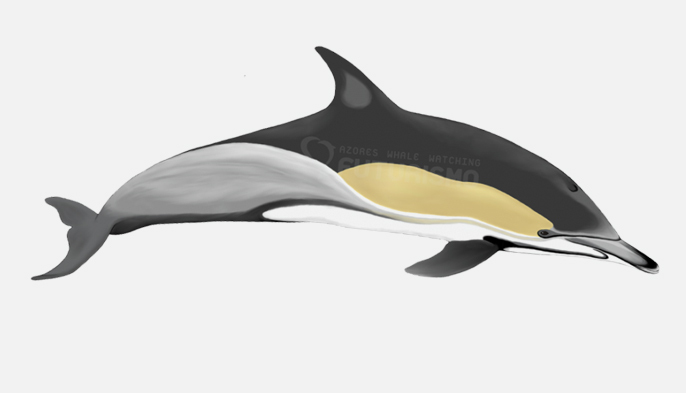 Whale and dolphin watching, birds and other marine species during the morning time. Stop in Vila Franca do Campo harbor, the old Capital from São Miguel Island and lunch on a local restaurant. Board into one traditional fishing boat that will take you to the Islet (15 min trip). Arrival to Vila Franca do Campo Islet, classified as a natural reservation. Here you will be able to snorkel in the salty water of the Atlantic Ocean. Returning to Ponta Delgada by boat or by bus. Note: This activity is only operated from June to September. We do have alternative experiences that we can recommend. DAY 4 – Full day tour to Furnas, with a pickup in your Hotel. 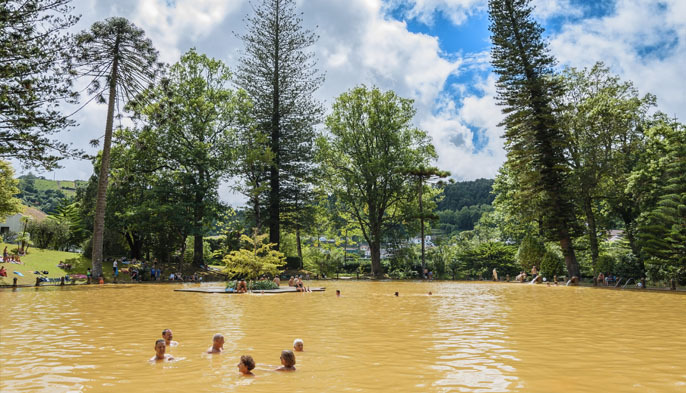 Visit the village of Furnas to see the fumaroles and to try several natural sparkling waters with different tastes and properties. Lunch the famous cozido meal. Taking a relaxing bath in the rich thermal waters where the temperatures are around 35º/40º C.
Returning to Ponta Delgada by the North Coast of São Miguel Island where you will stop in different viewpoints. Fogo Lake is a natural reservation with an incredible blue lake that was once one active volcano. You will continue your tour until Caldeira Velha. You will feel small around the power of nature. Here you can find fumaroles and also taking a bath in thermal hot waters. There is one absolute precious waterfall in this location. Picnic lunch on day 2 – baguette sandwich or salad, cupcake or energy bar, fruit, water and juice. Cozido lunch on day 4 – starter, Cozido, dessert and drinks included. Cozido contains: beef, chicken, pork, spicy sausage, blood sausage, potatoes, sweet potatoes, carrot, cabbage, green kale. All cooked during 6 hours with natural steam only. Lunch in a local restaurant on day 3 – starter, fish or beef, dessert and drinks included. Q: How do I get to the Azores? R: There are direct flights from Lisbon and Porto. Europe, EUA and Canadá. Q: Which level should I expect from the activities planned during the package? R: They are easy level. Q: This package of active holidays is exclusively for kids older than 8 years old? R: This is one ideal package for children older than 8 years old and younger as well for the most of the experiences. In the specific case of kids under 8 years old we strongly recommend the catamaran for the whale watching tour and on all the jeep tours we do provide children seats. Q: In which language is this tour? R: Mainly Portuguese and English. If you do prefer other language, please contact our travel experts. 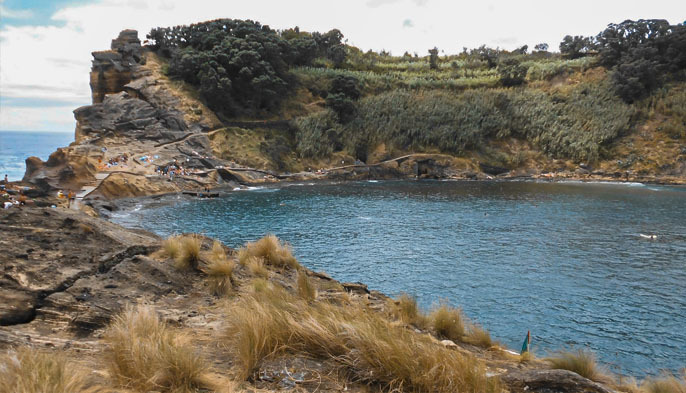 If you are thinking about visiting Pico Island, think about whale watching in the beautiful waters of this Island. 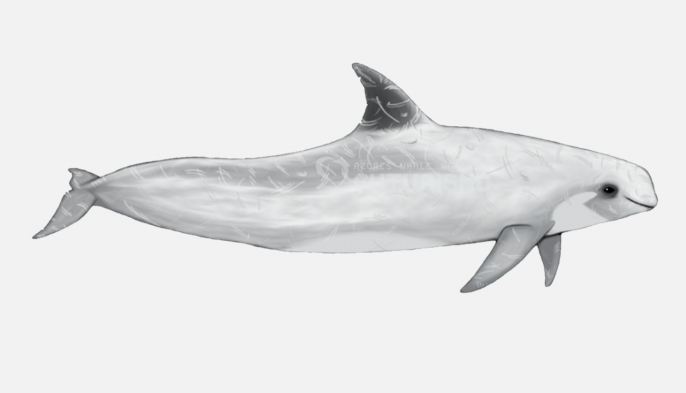 We designed one experience that will combined photography and cetaceans. If you love marine wildlife, join us and try being one of our “marine biologists” for a week.